Reducing the amount of energy required to keep your home comfortable during the extreme seasons is a daunting task, but a task that carries great rewards. By using less energy you’re not only being environmentally aware, but you can also save loads of your hard-earned cash. There are various methods you can employ to help keep your home warm and your bills low. Even though some of them require an investment, the payoff, in the long run, will be well worth it with lower bills and a more comfortable home. Below you can learn about some simple solutions that will keep your home cozy warm without the exorbitant energy costs. No, we don’t mean seal them so you can’t use them. We recommend sealing any drafty areas or areas where you can see light come through. 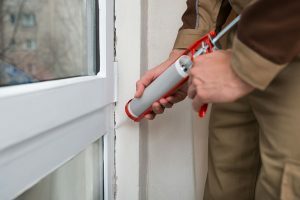 Use calk for holes around the frame and weather stripping for any drafts that occur within your door jamb, above, below or to the side of the door. The warm air that escapes through doors can comprise anywhere from 15 to 30% of your energy costs. Seeing as how your walls comprise the majority of the outer surface area of your home, it’s very important that they are insulated, and insulated properly. Cavity insulation is a very common and not terribly energy efficient type of wall insulation. With its lack of density, it doesn’t offer nearly as much energy-saving as its successors. Walls that were finished without insulation are not a lost cause! You can use spray-in foam insulation in walls that are uninsulated. All that is required is you make a small hole in each of the panels you intend to insulate, using a hole saw. Normally near the top of the wall so the insulation will fill what was previously a void. You can plug the holes by using the pieces you cut out before and applying some drywall tape and/or joint compound. More tips for insulating already finished walls can be found here. These types of windows allow a layer of air that’s sealed in-between the 2 or 3 panes to act as insulation against the outside air. Thought these window upgrades certainly are not cheap to purchase and install, they will pay for themselves over time. If you do buy new windows that are more energy efficient, be sure to check with local municipalities, cities or states to see if there is a tax incentive for buying them. Governments love when you save energy and oftentimes will compensate you for doing so. By following one or all of these simple steps you may reduce your heating costs and be able to keep your home nice and toasty.